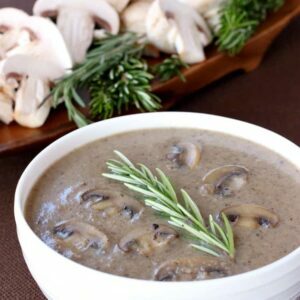 Creamy Marsala Mushroom Soup is so amazing even I don’t miss the meat! Every time I have tasted a vegetarian meal I say the same thing. This is good – but it would be so much better with _____. Fill in the blank…chicken, beef, pork, etc. Or even fish like in this Lobster Chowder. Whatever meat I think would work best for that dish. Eye rolls all around the table whenever I say it but I still say it. This tomato soup might also be one exception to the rule, but other than that, I’ll pass on the meatless Mondays. 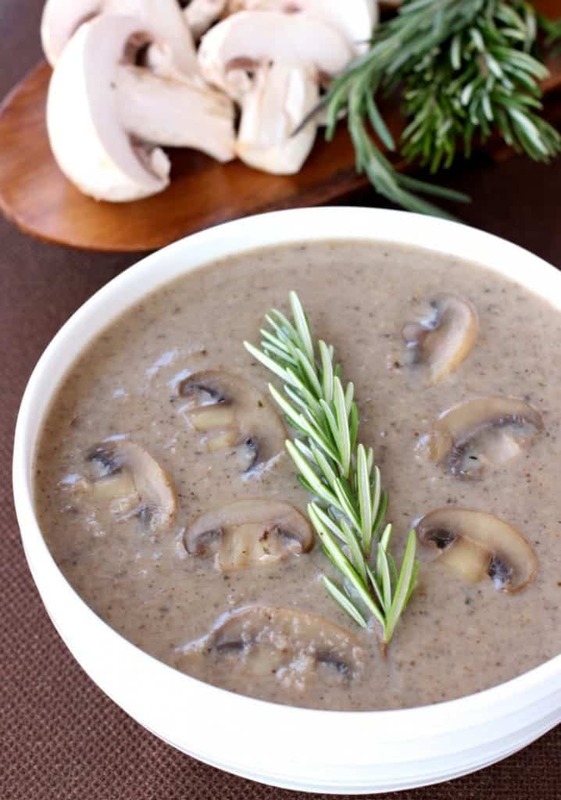 This Creamy Marsala Mushroom Soup is definitely being added to the list though. 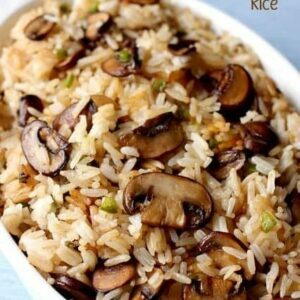 It has so much flavor from the mushrooms and marsala wine you totally don’t miss anything at all when you’re eating it. The part about this soup that makes it taste so good is browning the mushrooms. You’ve got to let them brown in butter with the onions for a good 15 minutes until they get really dark in color. That’s where all the flavor is – then you pour marsala wine all over and let it cook down. Then the rest is easy – just add in some garlic, chicken broth, salt and pepper, rosemary and a little bit of cream and let it cook for about 20 minutes. Blend it up with a stick blender until it’s smooth and creamy and dig in. 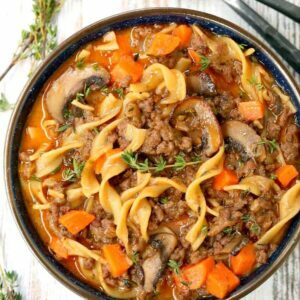 If you want to leave some mushrooms whole just spoon a few out before you blend the soup up – or if all smooth is your thing then blend away. 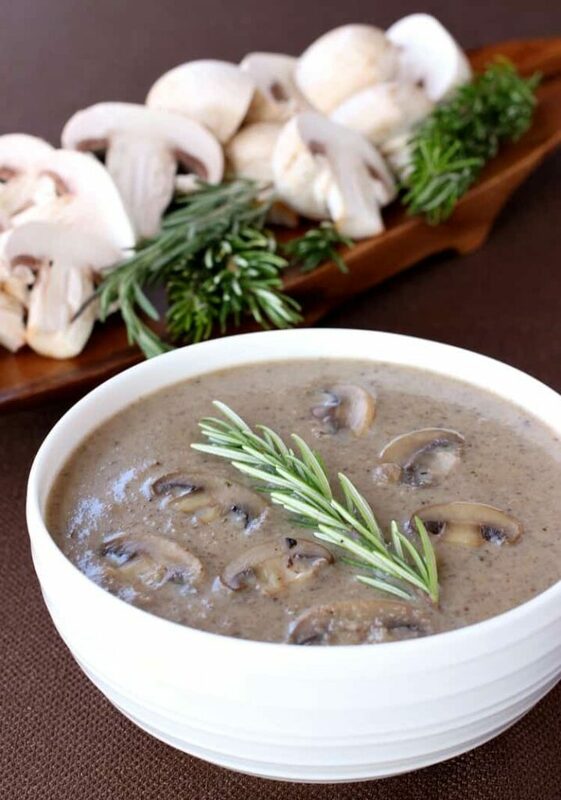 All this Creamy Mushrooms Marsala Soup needs is a big hunk of bread on the side! Add the butter to a large pot over medium heat. Once the butter is melted, add in the mushrooms and onions then stir. Cook for 10-15 minutes until browned over low heat, stirring often, then add the garlic to the pan. 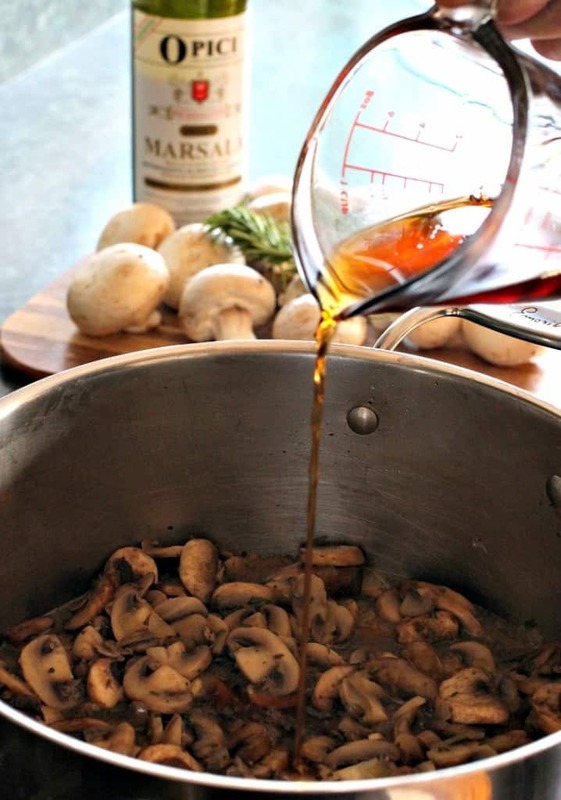 Pour in 1/3 cup of the marsala wine to deglaze the pan, scrapping up the bottom of the pan while you stir. Cook for 2-3 minutes until the liquid is almost completely gone. Add the chicken broth, rosemary, cayenne pepper and nutmeg. then turn the heat down to simmer for 20 minutes uncovered. 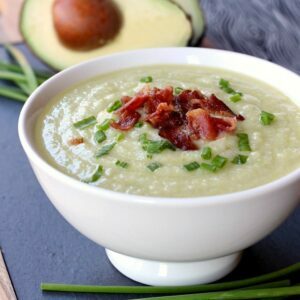 Blend the soup with an immersion blender until smooth, then pour in the cream and stir. If you don’t have an immersion blender, you can transfer the soup in batches to a regular blender instead. Let the soup cool for a few minutes before you put it in the blender and don’t fill it more than 1/3 of the way full.